Q1: What Is A Week In The Life Like For You In Terms Of Healthy Eating And Fitness. Would You Give Us a Quick Run Through Please? I suppose I approach my food and workouts in a manageable way. I just try to make the best choices that I can and workout smartly so as to make the best of the time I have. My main focus and goal is to be fit and healthy. I enjoy so many types of training but my favourites have to be weights and HIIT workouts. I just think they work very well for me. I usually aim to train about 4-6 times a week and make the best food choices day to day. If I have to prep food I do but I don’t live my life out of tupperware boxes. I love fresh fruit and veg and always try to concentrate on a good protein intake daily with some healthy fats and good carbs. Q2: Talk Us Through Your Workout Routine In A Typical Week. Q3: Do You Follow Any Particular Diet or Lifestyle? What’s Your Nutritional Plan? No not really. I just try to make good food choices. I took the time to educate myself on food and how it feeds the body and what foods work best for particular body goals. With this knowledge I always aim to just make the best choices I can. I don’t follow MACROS but I am aware of the amounts of proteins, fats and carbs I take in day to day. I am not overly strict with myself and I don’t feel guilty about having the odd treat. It took me so long to realise that food is your friend so long as you know what is in the foods you eat and you choose fresh foods as much as possible. Q4: What’s Your Thoughts On Cheat Days or Treats? I think there is room for them. Life is for enjoying. But depending on your fitness goal these might have to be reduced, monitored or reigned in. But in general I feel that allowing yourself a little bit of the bold stuff will serve you well. It’s good for the body to be treated to what you like and even better for the mind. Q5: Do You See A Difference In Your Mood When You Don’t Workout? Oh massively. Training was always my natural mood booster. It’s incredible how it can lift your spirits. If I’m in terrible form or particularly stressed all I really need to do is pop the headphones in and take a little “me time” in the gym. Q6: If You Could Only Have Four Beauty/Cosmetic Treatments What Would They Be? My facial cream – I use the Environ products and see a massive difference. Q7: Do You Believe In Health and Fitness Being A Holistic Process? Yes I do. I am very much into how the body and the mind work together. I think this has developed more the older I’ve become. Understanding the connection between the body and the mind and the energy you have within is something I want to keep learning more about. Q8: What Does Active Living Mean To You? I think it just means fitting as much movement into your life. It really does’t matter if what suits you is a 20 minute workout 3 times a week or marathon running or hill walking or cycling. Find what you love and do it. Keep your body healthy and active and moving as well as you can. Q9: How Do You Overcome Negative Thoughts? This is something that we all face. What I try to do, with thoughts that are maybe lingering in my head, is I try to think of and say some affirmations. I know it might sound weird but sometimes saying aloud some positive affirmations to counteract those negative thoughts will be all you need to overcome them. Q10: Have You Ever Been Given A ReallyGreat Health & Fitness Tip? Don’t compare yourself to anyone, Just be the best version of you. Q11: What’s The Best Health & Fitness Tip You Can Give? Oh it would have to be the above. I really do like to install in people that fitness and food should be a very good part of your life and not something you have to fight towards. Start with small changes to an unhealthy lifestyle and keep building on those. We all go backwards at times too. I am not “on track” 100% of the time. Its always a work in progress. Q12: Who Or What Inspires You? Girl bosses! I am so driven watching other leaders in this industry and in others. It’s motivational to see peoples drive and ambition. I sang as a backing singer at The Eurovision Song Contest for Ireland for three years in a row! 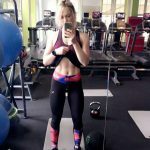 Check out Leannes, website, Instagram, Snapchat and Twitter for a insight into her life and lots of tips, workouts and recipes.